Returning or Exchanging Your Door Hardware is Easy. Just contact us with your return information by phone or by email. - Which items you are returning. - The reason for your return. *for your convenience, we will email you a UPS shipping label. The shipping cost will be deducted from the credit issued. Return shipping cost uses the same rates as our regular shipping schedule below. We CANNOT send return labels to International customers. Returns must be made with 60 days of order placement. Return shipping costs are the customer's responibility. The exception to this policy is when an item is shipped incorrectly or damaged from one of our shipping warehouses. Once products are received your original credit card used to make the purchase will be credited for the original cost of goods, less return shipping cost (if you used a label we sent you) and re-stock fees if applicable. To receive refunds on returned goods, the items cannot be damaged or installed and, must be in their orignal containers in new condition with all of the parts inside. Please be sure to package your items well. Items that are not packed in their original packing or just thrown back in the box usually have to be scrapped and therefore no credit will be issued. Orders with more than 5 locks returned may be assessed a re-key charge. We offer free keying on most orders, but if the entire order is returned we then have to rekey them a second time to return them to stock. Please allow up to 1 week from the time we receive your items for the credit to be processed and posted to your original payment method. There are no refunds on products that have been misused, abused or rendered unless as a result of improper use or installation. All returned items must be returned with 60 days of receipt and must be returned in th original packaging and condition. Unfortunatley, we do have to charge a restocking fee on most products. Some of our most popular door hardware is assembled per order at the manufacturers facility. This means if you return it the item has to be disassembled and put back on the shelf. We do what we can to keep restocking fees at a minimum. Please refer to the listing of restock fees by brand below to see what you can expect. Bucksnort Lodge - Wildlife hardware and novelty cabinet knobs are made per order and because of their customized nature, have a 50% restock fee. Brass Accents - Kick plates are custom made - standard sizes on our website are returnable but subject to a 25% restock fee. Custom Sized kickplates are non-returnable. Emtek Hardware - All Emtek hardware is assembled per order and are subject to a 25% restock fee. Baldwin Hardware - All Baldwin Estate Series hardware is assembled per order and are subject to a 25% restock fee. Baldwin Prestige and Reserve series are subject to 15% restocking fee. Inox Hardware - All Inox hardware is assembled per order and are subject to a 25% restock fee. AHI Hardware - All AHI hardware is assembled per order and are subject to a 25% restock fee. Cavilock Hardware - All Cavilock hardware is assembled per order and are subject to a 25% restock fee. 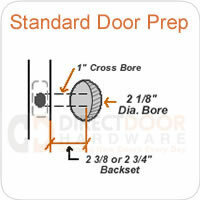 Granduer - All Granduer door hardware is assembled per order and are subject to a 25% restock fee. Nostalgic Warehouse - All Nostalgic Warehouse hardware is assembled per order and are subject to a 25% restock fee. Schlage, Sure-Loc, Rusticware, Kwikset and Weslock - 15% restock fee. Top Knobs Cabinet Hardware - 25% restock. Whitehall Products - all items are custom made and are non-returnable. Non-Returnables: Items that have been installed and or are not in their original packaging are not returnable. There are also no returns on custom made items such as custom kickplate sizes or address plaques. Custom made items are manufactured specifically to your specifications and cannot be resold. Residential grade hardware products used for commercial applications are not covered under the manufacturer's warranty.